The SpacePole Drive-thru solution answers the very real problem of taking payments in a time pressured environment whilst protecting the payment terminal. Transform the customer experience with increased speed of card payments both at the window and in the line With over 60% of business typically taken via the drive-thru, this customer experience is one you cannot afford to get wrong. Unhappy customers do not return. However, using the right technology in the right way, can and does make all the difference. Card payment transactions are one of the slowest elements of the drive-thru. Making sure the transaction is as efficient as possible in terms of accuracy and speed, contactless or manual, is key to that customer experience. Apart from being slow, handing a payment terminal to the customer without any mounting solution can result in dropped and damaged devices, tangled cables and the actual theft of the terminal itself. There are also ergonomic implications for the drive-thru operator as they must lean out of their workstation with the payment terminal for PIN entry or contactless payments as well as privacy issues for the customer when entering PIN or signature. The SpacePole Drive-thru solution answers the very real problem of taking payments in a time pressured environment whilst protecting the payment terminal. 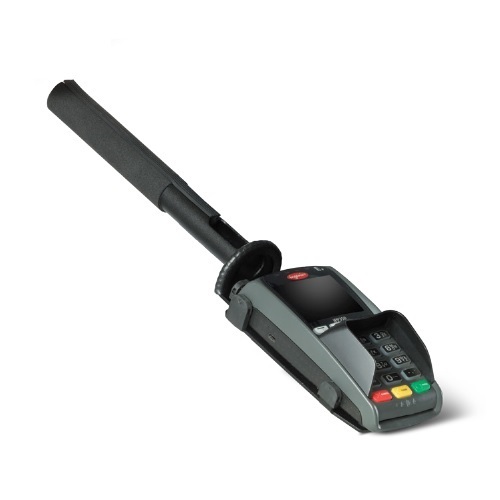 Fitted with a MultiGrip™ plate, it is compatible with devices from all leading manufacturers such as Ingenico and Verifone and when fitted with ClickSafe® security locks, it helps fight fraud and meet PCI best practice recommendations. * Generic image used. EFTPOS terminal not included.